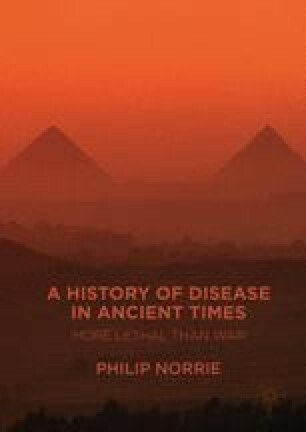 Dr. Norrie provides a summary of the fifteen currently accepted causes for the end of the Bronze Age in the Near East and then goes on to discuss the sixteenth reason—infectious disease epidemics. These are the real reason that the end of the Bronze Age in the Near East was called either the “catastrophe” or the “collapse” due to its short time frame of 50 years, the mass migration of the general population and the “Sea Peoples” plus the abandonment of cities such as Hattusa, the capital of the Hittite Empire c.1200 bce. The diseases most likely to cause this collapse are smallpox, bubonic plague and tularemia.